The Round Robe Hook is an excellent space-saving alternative to large towel rails. 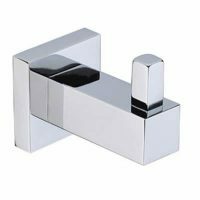 This popular bathroom accessory features a simplistic, yet highly functional design and makes for an elegant addition to any bathroom space. This robe hook features a contemporary, geometric design, which will do well to complement modern bathroom décor. It is recommended for installation on a wall or a door and offers easy and straightforward installation. The Round Robe Hook features two heavy-duty prongs and can easily hold a robe and a towel. The body is smooth, which prevents garments from pulling and tearing. This robe hook is manufactured to the highest standards of quality and makes use of solid brass construction. It is reliable, highly durable and will withstand several years of usage. Moreover, the polished chrome finish will not lose its shine even with time. 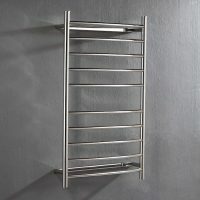 This popular bathroom accessory is an Australian manufactured product, which exhibits a superior grade of workmanship. It is a top-notch product which meets all standards of quality. Go ahead and accessorise your bathroom with the trendy Round Robe Hook. Purchase this product at an incredibly affordable price from our online store today! Visit our showroom in Perth or shop online for and take advantage of our free Perth Metro shipping.